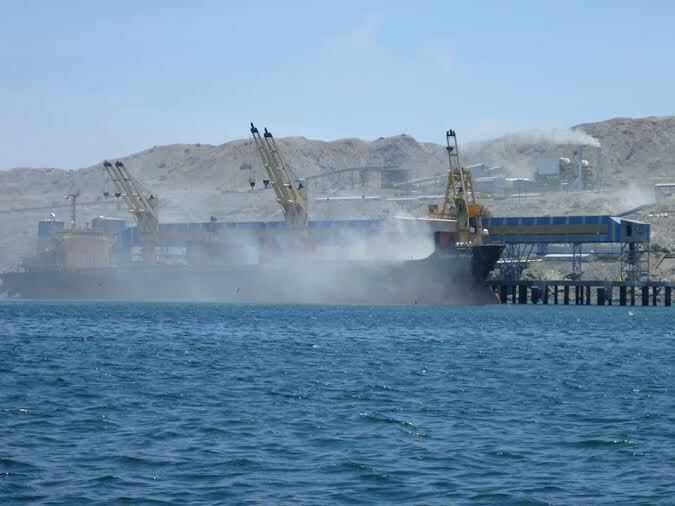 The Bayóvar mining complex exported 3.7 million tons of phosphate concentrates in 2013, but its environmental impacts may jeopardize the local fishing industry. As mining expands, a vital estuary is left unprotected, while the local Defense Front says the Bayóvar contract needs to be reviewed. In January 2014, researcher and mining consultant Miguel Santillana published an article in La República which decried “anti-mining activist Lupo Canterac and the revival of anti-investment forces in the Piura region.” Who was this Lupo Canterac, seen as such a threat to mining interests in northern Peru? I found Lupo at the headquarters of the Central Piurana de Cafetaleros, the base of the coffee growers’ union next to a bus terminal in Piura. Lupo is one of the coordinators of the Water and Life Network (Red Agua Vida, RedAD) and also works with the Red Muqui, both concerned about the impacts of large scale mining projects. For my part, I was hoping to learn more about the Bayóvar mine, owned by the Brazilian firm Vale. We were also part of a network of communities affected by its projects and supporting organizations from Canada to Mozambique and Argentina to Indonesia. The network’s Justiça nos Trilhos campaign labeled Vale globally as the “world´s worst corporation” in 2012. The Bayóvar mine and its infrastructure were built in lands of the community of San Martín de Sechura, which overlaps almost entirely with the province of Sechura. The history of the community is basically a recurring struggle in defense of their territory. In the 1930s, an early leader of Sechura was Vicente Chunga Aldana, sometimes called the Rosendo Maqui of Piura, after the defiant community leader in the classic Peruvian novel by Ciro Alegría, El Mundo es Ancho y Ajeno. Under Chunga’s headship, Sechura achieved the official recognition of the communal lands in 1937. Today the territory is about 700,000 hectares and has a population of around 60,000 inhabitants. This history would slowly be dismantled in the 2000s, as the community entered into disputes with the mining companies. The Frente de Defensa de la Comunidad Campesina San Martín de Sechura, an organization of union associations and fishers, says the contract for the Bayóvar mine needs to be reviewed. Augusto Chapilliquén, spokesman of the Front, said that “the establishment of the private foundation ignored Peruvian peasant communities legislation.” Yet the foundation mechanism creates a legal framework that seems hard to challenge: René Cornejo, who was director of ProInversión when the Vale contract was signed in 2005, was named Prime Minister by President Ollanta Humala in February of this year. On April 17, 2008 the Ministry of Energy and Mines issued the Executive Resolution 084-2008-MEM/AAM that granted an environmental license for the Bayóvar project. Construction began in November that year: access roads, processing plant, port, 41 km of power lines, and a desalination plant. The Environmental Impact Assessment (EIA) of the project, prepared by Golder Associates Peru SA, promised maximum care for the environment. But over time the air, land and water near the mining operations started to experience its negative impacts. The Federation of Petroleum Workers of Peru (Federación de Trabajadores del Petróleo del Perú) and the Sechuran Association of Transporters, Heavy Machinery & Services (Asociación de Transportistas, Maquinaria Pesada y Servicios de Sechura) denounced that airborne dust resulting from the embarking of phosphates were affecting their workplace, the Petroperu port adjacent to the port built by Vale. The Agency for Assessment and Environmental Control (Organismo de Evaluación y Fiscalización Ambiental, OEFA), governing body of the National Assessment and Environmental Control (Sistema Nacional de Evaluación y Fiscalización Ambiental, SINEFA), fined Minera Miski Mayo with ten tributary units through the Directorial Resolution 518-2013-OEFA-DFSAI in November 2013. The Front of Fishermen of Puerto Rico (Frente de Pescadores Artesanales Acuicultores de Puerto Rico, AFREPAAC) and the Association of Fishermen and Seafood Extraction of Parachique (Asociación de Pescadores Artesanales Extractores de Marisco Parachique, APEMAR) denounced the pollution of the bay. In November 2013 the Mayor of the province of Sechura reported that Vale spills were provoking the “overgrowth of algae on the coast where our fishermen work”. An Artisanal Fisheries Census carried out in 2012 revealed that Piura region has the largest number of artisanal fishermen and boat builders in the country. The Sechura Bay is also one of the largest domestic producers of bivalve mollusks and marine-culture is a relevant economic activity. Eutrophication, or the increase of nutrients in an ecosystem, generally causes excessive biomass growth and impoverishment of diversity. Local eutrophication can generate turbidity and prevent light from penetrating to the bottom, affecting most of the fauna. On November 22, 2013 a meeting was held in the town of Puerto Rico to discuss the controversy regarding the social and environmental impacts of Minera Miski Mayo, with the presence of representatives from the National Office of Dialogue and Sustainability, the Mayor of Sechura, representatives of social organizations, the Ombudsman’s Office and officers from the Ministry of Energy and Mines. The demand was the immediate cessations of mining operations until a response was given to the complaints. Vale invested US$566 million in the construction of the mine and its associated infrastructure. In 2010, the company sold two slices to multinational firms Mosaic of the United States (35%), the biggest global combined producer of phosphate and potash, and Mitsui of Japan (25%). Most of the world production of phosphate rock is used as fertilizer. As a major global agricultural exporter, Brazil must import the minerals needed to feed its giant production system (purchases totaled US$9.1 billion in 2013, according to official sources quoted by EFE). But according to the Willaqniki Report, published by the National Office of Sustainability and Dialogue in January 2014, “the producers of the Sechura Bay oppose the implementation of the second stage of Minera Miski Mayo mining plans”. The coast of the Sechura bay is permeable, imprecise. The sea enters the continent and then retreats. The Virrilá Estuary, the Ramón and Ñapique lagoons and The San Pedro Mangroves, in the lower Piura river basin, are one of the largest habitats for aquatic and migratory birds along the Southamerican Pacific coast. But only the San Pedro Mangroves are formally recognized as a Municipal Conservation Area and as a Ramsar site, one of the thirteen sites designated as wetlands of international importance in Peru. According to a report posted in the Ramsar Convention website, “the wetland is currently threatened due to inadequate management and lack of planning”. A few years ago, regional and local authorities began the proceedings to establish the Regional Conservation Area of Community Wetlands Virrillá – Ñapique and Ramón, covering an area of 53,871 hectares in the districts of Sechura and Cristo Nos Valga. As home for migratory and permanent bird populations, its ecological value is incalculable: some 115 species have been identified within the proposed conservation area, 21 of them from the northern hemisphere. But according to the Regional Office of Energy and Mines, its boundaries overlap with 17 mining concessions, which occupy 82% of the total proposed area. 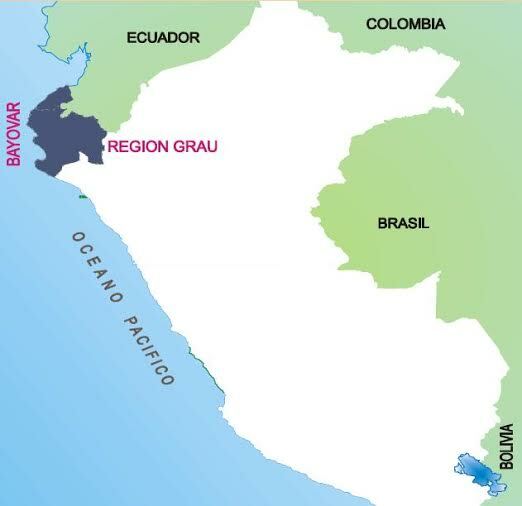 These rights are owned by the Hochschild Group, one of Peru richest and operator of the Fosfatos del Pacífico project. Hochschild already signed a contract with the private foundation established by the government to sign the Bayóvar contract. For the Defense Front, it is a clear case of land grabbing, as the land belong to the Sechura Community, not to the private foundation, as stated in the document “Observations to the Environmental Impact Study of Fosfatos del Pacífico SA” submitted to the Ministry of Energy and Mines in October 2013. 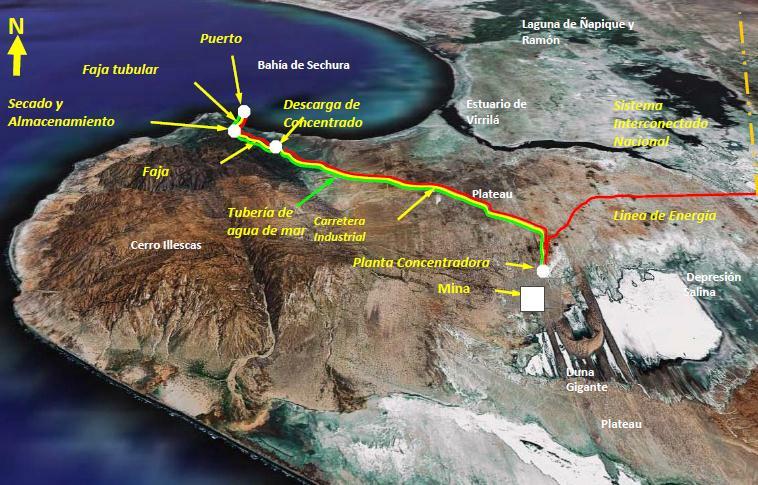 Fosfatos del Pacífico project is located about 10 km north of Vale’s operations. The massive open pit mine will double the impacts already caused by large scale mining in the Sechura Bay. In the adjacent concessions Canadian junior Focus Ventures operates the Bayóvar 12 project, which covers some 12,000 hectares, with local partner Juan Paulo Quay SAC. Americas Potash, a joint venture owned by Canada’s Americas Petrogas and Indian Farmers Fertiliser Co-Operative Limited (IFFCO) of India, also holds mining rights in the area. While I was back in Lima writing a field report for the Justiça nos Trilhos campaign, in the last week of March 2014 the city was named the capital of literature and dozens of writers from all over the world came to the I Vargas Llosa Novel Bienal. The Hochschild Group provided the funds for the grand novel contest. I sent an email to Lupo Canterac for him to review my notes and to check whether he knew if the environmental license to the Fosfatos del Pacífico project was already granted by the Ministry of Energy and Mines. It was not. I also asked his thoughts about the novel prize sponsored by the Hochschild Group and we agreed that environmental impact studies seem to be a prolific genre in Peru.